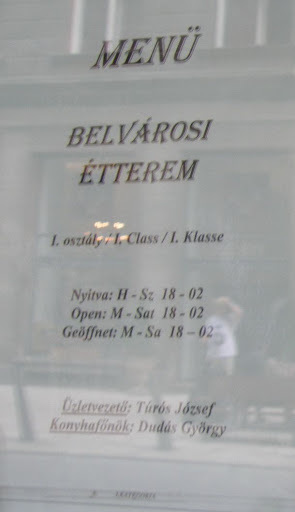 The new name of the infamous Galaxia Bar is Belvarosi etterem (restaurant). A budapesti vendéglátós rablótanyákat bemutató sorozatunk folytatódik, most a nemrég nevet változtatott Galaxia Bar-t mutogatjuk, amely legújabban Belváros étterem néven zsebeli ki a turistákat. Egy étterem disztletei között))) Turistákra szakosodott, párban vadászó konzumpicsák leszólítják a turistát (adjon egy tüzet/ merre van a .../ ismer-e egy jó kocsmát), hülye turista meg megy, nem ismeri a Váci utca ezen specialitását: rablás engedéllyel. Az "étterem"-nek álcázott rablótanya ugyanis annyi pénzt kér a becsalt turistától, amennyit nem szégyell. És itt nem szégyellős emberek tevékenykednek. A vendéglátás parazitái ők, ungarische spezialität, Magyarország hírnevének szorgos rongálói. És a hatóságok a jelek szerint tehetetlenek ezen pofátlan rablók esetében, vadkapitalizmus van, szabadáras minden. Az árak különben is fel vannak tüntetve a kirakat üvegén, miért nem használják a szemüket a profi pasifogó szárazkurváktól bekísért balfaszok. Milyen meglepő, hogy ugyanaz a "menedzsment" dolgozik itt is, mint a Városközpont étteremben. Nem okoz problémát két "éttermet" és "konyhát" vezetni. Elvégre közel vannak egymáshoz ezek a turistacsapdák. Mike "I believe there are plenty of alternative destinations in eastern Europe." I was scammed in the Galaxia pretty much by the same method as previously described. After a full day seminar I was looking for a place that sold water - I like to keep at least one liter in my room for brushing teeth, hangovers aso. On the main walking street two student like girls approached me asking for directions, I showed them my map. Now, the beauty of the scam was the ability of these girls to make me believe I was making my own decisions. I was pretty much aware that a scam was taking place, but could not figure it out due to the almost childlike simplicity of it. It ended up with myself taking the two girls to the bar (Galaxia) in which I could buy the water, they kindly offered me a traditional Hungarian drink and made excellent conversation. I was focusing heavily on what was put in my glass, don't want to pass out in a strange town. The girls wanted to eat but where indecisive, I told them I had to leave. 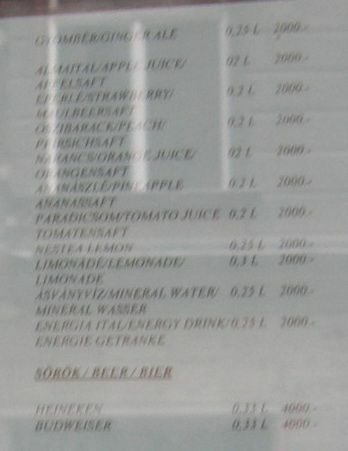 The tab for three drinks was 67000HUF which by any standard is a high price (around 230 euro). I realized I was the only guest there, a part from three waitresses and a large man blocking the exit. Swapped menu's were presented to me. Things become quite heated and I was pretty certain that it would become physical at some point. Luckily my cheap bastards skills came through, I quickly made the decision to play along and payed 'my' part of the bill 21000HUF in cash. In my home town that would be double pricing of three drinks, besides I can't get much dentistry work done for that. The splitting of the bill distracted the party into multiple arguments even if they were mostly for show. Apart from an outspoken keenness to acquire my credit card, I was able to leave without violence even though a bit of sidestepping and confusion was needed. Needless to say I did not take a direct route to my hotel and I resorted to using the local water for brushing my teeth. The experience was quite bad as I truly believed I was going to have to fight my way out (which was probably a reasonable assumption). I am not going back to Budapest and I discourage anyone from going there, not because of this single incident, but in addition to the numerous other scams you have to be aware of (taxi's, local transport, restaurants etc. )- I believe there are plenty of alternative destinations in eastern europe. I went on a three day 'break' to budapest having been made redundant from my job. On the first night I was walking down the main street of what I thought was a decent area. Approached by two ladies who seemed normal looking for irish bar..they suggested going for a drink. Galaxia bar just happened to be near by...I ended up paying 500 euro from a bill of 800 euro amid some angry scenes and threats- in the end i had to do a runner - the bar is run by crinimals- I feel very down about how I trusted these people and how there is no one to turn to in this hellish city...I went home the next morning, cutting my trip short. Please stay away from Budapest and Galaxia Bar. GALAXIA IST EIN MAFIA LOKAL!!! ICH WURDE NACH DEM SELBEN SCHEMA REINGELEGT UND MUSSTE FÜR EIN DURCHSCHNITTLICHES ESSEN 140000 FORINT BEZAHLEN. DIE PREISE FÜR DIE GETRÄNKE SICH WUCHERPREISE. DER FINANZIELLE VERLUST IST ZWAR ÄRGERLICH ,ABER DER SKANDAL IST, DASS DIE POLIZEI UND DIE STADT BUDAPEST NICHTS DAGEGEN UNTERNEHMEN UM AHNUNGSLOSE TOURISTEN VON SOLCHEN KRIMINELLEN MACHENSCHAFTEN ZU SCHÜTZEN UND IHNEN DAS HANDWERK ZU LEGEN. NEVER go to this bar or let you guide to this place by wonderful looking girls. The same happened to me. My bill was around 180000 HUF. I went to the police station later, but they can not really do anything. The money is lost. Just a few bars in, almost choreographed, the bartender walks up to the table and informs us that its time for us to go. "The credit machine is broken and we will need to pay in cash. You maybe need ATM? "She hands us the bill and shock sets in. Shock, when taken out of context actually looks funny when on the faces of friends. The confusion in the eyes, the self doubt, the brain turning on itself searching for the critical system error. And then you take the bill and it hits you too. "Not 40,000 HUF. 4000HUF. That's 4,000 right? 1,2,3,4 no that's 40,000 but how much is that in U.S. Dollars?" The music is still paying and the bartender is flexing her muscles. And the werewolf at the piano is watchful and smiling. "That's over $250 US! That cant be right. Excuse me but there's a mistake." I say as I stand up to show her the bill. "No Mistake." She says flatly. And she produces a menu. 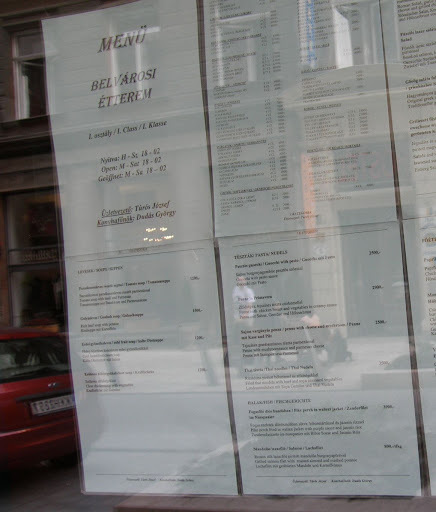 And now I notice there are menus on all the tables. Menus that were not there when we sat down. "Why don't I call the police!" 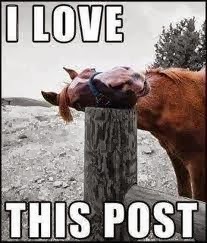 I say. But she just smiles, and as we both know this is a hollow threat. I don't even know how to call the police in Hungary and I doubt she'll let me borrow the phone. Running is not an option, as there is far too much experienced muscle between us and the door and besides we couldn't leave these nice girls here to fend for themselves. So we start digging for cash. The girls are simple outraged. Black eyes says "I feel so bad!" How can they do this? It is terrible." And with that she drops $10K HUf on the table. In my heart I knew it was all a lie. But what could I do. We were not leaving without paying. Nem messze lakom eme "híres" "műintézménytől"! Kurvára (hehe) zavaró, hggy a környéken állandó jelleggel 10 ilyen szárazkurva illegeti magát. Ezt a kifejezést is itt hallottam, akkor ha jól értem, akkor ezek olyan kurvák, akik nem dugatják meg magukat, hanem átvernek mindenkit? Egyszer egy haveromat is beküldtem oda, hogy ott várjon meg, mert én nem ismertem akkor még a helyet. Vannak akik nem ismernek meg... és unalmas elküldeni már őket a halálba állandóan. Volt hogy a haverommal szívattuk őket, kiadtuk magunkat turistáknak... vicces volt és rémisztő, hogy mennyire aljas szövegeket használnak, csak hogy felszedjenek!!! fél óráig hülyítettük... elég hamar vittek volna iszogatni, mi meg mondtuk, hogy még sétálnánk, jöjjenek. Persze nem jöttek. Feltűnően jól kommunikálnak, honnan a picsából szerzik őket? Egyébként ez tényleg egy nagy banda lehet, legalább 50, ha nem 100 fővel. Már addigra ismertem sok arcot, így tudtam, hogy valami gyűlés lesz, van. Na most 17.30 kor elkezdtek kirajzani. Persze párosával. Legalább 15 párt számoltam meg. Nagyon sok ember, és mindenki tudja, hogy szívatják a jónépet, azaz a turistákat. Hihetetlen, hogy vannak emberek, akik ennyire undorító dolgokat tudnak művelni.